Human activities can also change earth's climate, and are presently driving climate change through global warming. There is no general agreement in scientific, media or policy documents as to the precise term to be used to refer to anthropogenic forced change; either "global warming" or "climate change" may be used. The field of climatology incorporates many disparate fields of research. For ancient periods of climate change, researchers rely on evidence preserved in climate proxies, such as ice cores, ancient tree rings, geologic records of changes in sea level, and glacial geology. Physical evidence of current climate change covers many independent lines of evidence, a few of which are temperature records, the disappearance of ice, and extreme weather events. The most general definition of climate change is a change in the statistical properties (principally its mean and spread) of the climate system when considered over long periods of time, regardless of cause. Accordingly, fluctuations over periods shorter than a few decades, such as El Niño, do not represent climate change. The term "climate change" is often used to refer specifically to anthropogenic climate change (also known as global warming). 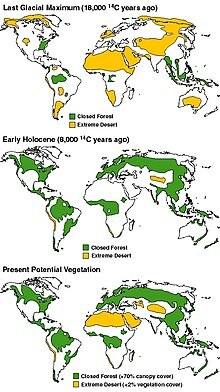 Anthropogenic climate change is caused by human activity, as opposed to changes in climate that may have resulted as part of Earth's natural processes. In this sense, especially in the context of environmental policy, the term climate change has become synonymous with anthropogenic global warming. Within scientific journals, global warming refers to surface temperature increases while climate change includes global warming and everything else that increasing greenhouse gas levels affect. A related term, "climatic change", was proposed by the World Meteorological Organization (WMO) in 1966 to encompass all forms of climatic variability on time-scales longer than 10 years, but regardless of cause. During the 1970s, the term climate change replaced climatic change to focus on anthropogenic causes, as it became clear that human activities had a potential to drastically alter the climate. Climate change was incorporated in the title of the Intergovernmental Panel on Climate Change (IPCC) and the UN Framework Convention on Climate Change (UNFCCC). Climate change is now used as both a technical description of the process, as well as a noun used to describe the problem. Prior to the 18th century, scientists had not suspected that prehistoric climates were different from the modern period. By the late 18th century, geologists found evidence of a succession of geological ages with changes in climate. In the years since, a great deal of scientific progress has been made understanding the workings of the climate system. Scientists generally define the five components of earth's climate system to include atmosphere, hydrosphere, cryosphere, lithosphere (restricted to the surface soils, rocks, and sediments), and biosphere. Natural changes in the climate system ("internal forcings") result in internal "climate variability". 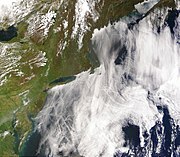 Examples include the type and distribution of species, and changes in ocean-atmosphere circulations. The ocean and atmosphere can work together to spontaneously generate internal climate variability that can persist for years to decades at a time. Examples of this type of variability include the El Niño–Southern Oscillation, the Pacific decadal oscillation, and the Atlantic Multidecadal Oscillation. These variations can affect global average surface temperature by redistributing heat between the deep ocean and the atmosphere and/or by altering the cloud/water vapor/sea ice distribution which can affect the total energy budget of the earth. The oceanic aspects of these circulations can generate variability on centennial timescales due to the ocean having hundreds of times more mass than in the atmosphere, and thus very high thermal inertia. For example, alterations to ocean processes such as thermohaline circulation play a key role in redistributing heat in the world's oceans. Due to the long timescales of this circulation, ocean temperature at depth is still adjusting to effects of the Little Ice Age which occurred between the 1600 and 1800s. In the context of climate variation, anthropogenic factors are human activities which affect the climate. The scientific consensus on climate change is "that climate is changing and that these changes are in large part caused by human activities", and it "is largely irreversible". 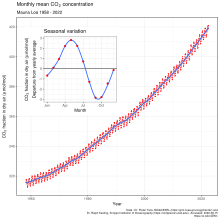 Of most concern in these anthropogenic factors is the increase in CO2 levels. This is due to emissions from fossil fuel combustion, followed by aerosols (particulate matter in the atmosphere), and the CO2 released by cement manufacture. Other factors, including land use, ozone depletion, animal husbandry (ruminant animals such as cattle produce methane, as do termites), and deforestation, are also of concern in the roles they play—both separately and in conjunction with other factors—in affecting climate, microclimate, and measures of climate variables. Slight variations in Earth's motion lead to changes in the seasonal distribution of sunlight reaching the Earth's surface and how it is distributed across the globe. There is very little change to the area-averaged annually averaged sunshine; but there can be strong changes in the geographical and seasonal distribution. The three types of kinematic change are variations in Earth's eccentricity, changes in the tilt angle of Earth's axis of rotation, and precession of Earth's axis. Combined together, these produce Milankovitch cycles which affect climate and are notable for their correlation to glacial and interglacial periods, their correlation with the advance and retreat of the Sahara, and for their appearance in the stratigraphic record. The IPCC notes that Milankovitch cycles drove the ice age cycles, CO2 followed temperature change "with a lag of some hundreds of years", and that as a feedback amplified temperature change. The depths of the ocean have a lag time in changing temperature (thermal inertia on such scale). Upon seawater temperature change, the solubility of CO2 in the oceans changed, as well as other factors affecting air-sea CO2 exchange. Three to four billion years ago, the Sun emitted only 75% as much power as it does today. If the atmospheric composition had been the same as today, liquid water should not have existed on Earth. However, there is evidence for the presence of water on the early Earth, in the Hadean and Archean eons, leading to what is known as the faint young Sun paradox. Hypothesized solutions to this paradox include a vastly different atmosphere, with much higher concentrations of greenhouse gases than currently exist. Over the following approximately 4 billion years, the energy output of the Sun increased and atmospheric composition changed. The Great Oxygenation Event—oxygenation of the atmosphere around 2.4 billion years ago—was the most notable alteration. Over the next five billion years from the present, the Sun's ultimate death as it becomes a red giant and then a white dwarf will have large effects on climate, with the red giant phase possibly ending any life on Earth that survives until that time. Solar output varies on shorter time scales, including the 11-year solar cycle and longer-term modulations. Solar intensity variations, possibly as a result of the Wolf, Spörer, and the Maunder Minima, are considered to have been influential in triggering the Little Ice Age. This event extended from 1550 to 1850 AD and was marked by relative cooling and greater glacier extent than the centuries before and afterward. Solar variation may also have affected some of the warming observed from 1900 to 1950. The cyclical nature of the Sun's energy output is not yet fully understood; it differs from the very slow change that is happening within the Sun as it ages and evolves. Some studies point toward solar radiation increases from cyclical sunspot activity affecting global warming, and climate may be influenced by the sum of all effects (solar variation, anthropogenic radiative forcings, etc.). A 2010 study suggests "that the effects of solar variability on temperature throughout the atmosphere may be contrary to current expectations". In 2011, CERN announced the initial results from its CLOUD experiment in the Nature journal. The results indicate that ionisation from cosmic rays significantly enhances aerosol formation in the presence of sulfuric acid and water, but in the lower atmosphere where ammonia is also required, this is insufficient to account for aerosol formation and additional trace vapours must be involved. The next step is to find more about these trace vapours, including whether they are of natural or human origin. The eruptions considered to be large enough to affect the Earth's climate on a scale of more than 1 year are the ones that inject over 100,000 tons of SO2 into the stratosphere. This is due to the optical properties of SO2 and sulfate aerosols, which strongly absorb or scatter solar radiation, creating a global layer of sulfuric acid haze. On average, such eruptions occur several times per century, and cause cooling (by partially blocking the transmission of solar radiation to the Earth's surface) for a period of several years. The eruption of Mount Pinatubo in 1991, the second largest terrestrial eruption of the 20th century, affected the climate substantially, subsequently global temperatures decreased by about 0.5 °C (0.9 °F) for up to three years. Thus, the cooling over large parts of the Earth reduced surface temperatures in 1991–93, the equivalent to a reduction in net radiation of 4 watts per square meter. The Mount Tambora eruption in 1815 caused the Year Without a Summer. Much larger eruptions, known as large igneous provinces, occur only a few times every fifty – one hundred million years – through flood basalt, and caused in Earth past global warming and mass extinctions. Small eruptions, with injections of less than 0.1 Mt of sulfur dioxide into the stratosphere, affect the atmosphere only subtly, as temperature changes are comparable with natural variability. However, because smaller eruptions occur at a much higher frequency, they too significantly affect Earth's atmosphere. Volcanoes are also part of the extended carbon cycle. Over very long (geological) time periods, they release carbon dioxide from the Earth's crust and mantle, counteracting the uptake by sedimentary rocks and other geological carbon dioxide sinks. The US Geological Survey estimates are that volcanic emissions are at a much lower level than the effects of current human activities, which generate 100–300 times the amount of carbon dioxide emitted by volcanoes. A review of published studies indicates that annual volcanic emissions of carbon dioxide, including amounts released from mid-ocean ridges, volcanic arcs, and hot spot volcanoes, are only the equivalent of 3 to 5 days of human-caused output. The annual amount put out by human activities may be greater than the amount released by supererruptions, the most recent of which was the Toba eruption in Indonesia 74,000 years ago. The Earth receives an influx of ionized particles known as cosmic rays from a variety of external sources, including the Sun. A hypothesis holds that an increase in the cosmic ray flux would increase the ionization in the atmosphere, leading to greater cloud cover. This, in turn, would tend to cool the surface. The non-solar cosmic ray flux may vary as a result of a nearby supernova event, the solar system passing through a dense interstellar cloud, or the oscillatory movement of the Sun's position with respect to the galactic plane. The latter can increase the flux of high-energy cosmic rays coming from the Virgo cluster. Evidence exists that the Chicxulub impact some 66 million years ago had severely affected the Earth's climate. Large quantities of sulfate aerosols were kicked up into the atmosphere, decreasing global temperatures by up to 26 °C and producing sub-freezing temperatures for a period of 3−16 years. The recovery time for this event took more than 30 years. Climate change in the recent past may be detected by corresponding changes in settlement and agricultural patterns. Archaeological evidence, oral history and historical documents can offer insights into past changes in the climate. Climate change effects have been linked to the rise and also the collapse of various civilizations. Global temperature anomalies for 2015 compared to the 1951–1980 baseline. 2015 was the warmest year in the NASA/NOAA temperature record, which starts in 1880. It has since been superseded by 2016 (NASA/NOAA; 20 January 2016). 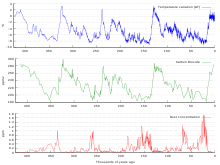 The instrumental temperature record from surface stations was supplemented by radiosonde balloons, extensive atmospheric monitoring by the mid-20th century, and, from the 1970s on, with global satellite data as well. Taking the record as a whole, most of the 20th century had been unprecedentedly warm, while the 19th and 17th centuries were quite cool. A world glacier inventory has been compiled since the 1970s, initially based mainly on aerial photographs and maps but now relying more on satellites. This compilation tracks more than 100,000 glaciers covering a total area of approximately 240,000 km², and preliminary estimates indicate that the remaining ice cover is around 445,000 km². The World Glacier Monitoring Service collects data annually on glacier retreat and glacier mass balance. From this data, glaciers worldwide have been found to be shrinking significantly, with strong glacier retreats in the 1940s, stable or growing conditions during the 1920s and 1970s, and again retreating from the mid-1980s to the present. Data from NASA's Grace satellites show that the land ice sheets in both Antarctica (upper chart) and Greenland (lower) have been losing mass since 2002. Both ice sheets have seen an acceleration of ice mass loss since 2009. The decline in Arctic sea ice, both in extent and thickness, over the last several decades is further evidence for rapid climate change. Sea ice is frozen seawater that floats on the ocean surface. It covers millions of square kilometers in the polar regions, varying with the seasons. In the Arctic, some sea ice remains year after year, whereas almost all Southern Ocean or Antarctic sea ice melts away and reforms annually. Satellite observations show that Arctic sea ice is now declining at a rate of 13.2 percent per decade, relative to the 1981 to 2010 average. The 2007 Arctic summer sea ice retreat was unprecedented. Decades of shrinking and thinning in a warm climate has put the Arctic sea ice in a precarious position, it is now vulnerable to atmospheric anomalies. "Both extent and volume anomaly fluctuate little from January to July and then decrease steeply in August and September". This decrease is because of lessened ice production as a result of the unusually high SAT. During the Arctic summer, a slower rate of sea ice production is the same as a faster rate of sea ice melting. Global sea level change for much of the last century has generally been estimated using tide gauge measurements collated over long periods of time to give a long-term average. More recently, altimeter measurements—in combination with accurately determined satellite orbits—have provided an improved measurement of global sea level change. To measure sea levels prior to instrumental measurements, scientists have dated coral reefs that grow near the surface of the ocean, coastal sediments, marine terraces, ooids in limestones, and nearshore archaeological remains. The predominant dating methods used are uranium series and radiocarbon, with cosmogenic radionuclides being sometimes used to date terraces that have experienced relative sea level fall. In the early Pliocene, global temperatures were 1–2˚C warmer than the present temperature, yet sea level was 15–25 meters higher than today. According to recent studies, global-mean sea level rose by 195 mm during the period from 1870 to 2004. Since 2004, satellite-based records indicate that there has been a further 43 mm of global-mean sea levels rise, as of July 2017[update]. Past precipitation can be estimated in the modern era with the global network of precipitation gauges. Surface coverage over oceans and remote areas is relatively sparse, but, reducing reliance on interpolation, satellite clouds and precipitation data has been available since the 1970s. Quantification of climatological variation of precipitation in prior centuries and epochs is less complete but approximated using proxies such as marine sediments, ice cores, cave stalagmites, and tree rings. In July 2016 scientists published evidence of increased cloud cover over polar regions, as predicted by climate models. A change in the type, distribution and coverage of vegetation may occur given a change in the climate. Some changes in climate may result in increased precipitation and warmth, resulting in improved plant growth and the subsequent sequestration of airborne CO2. A gradual increase in warmth in a region will lead to earlier flowering and fruiting times, driving a change in the timing of life cycles of dependent organisms. Conversely, cold will cause plant bio-cycles to lag. Larger, faster or more radical changes, however, may result in vegetation stress, rapid plant loss and desertification in certain circumstances. An example of this occurred during the Carboniferous Rainforest Collapse (CRC), an extinction event 300 million years ago. At this time vast rainforests covered the equatorial region of Europe and America. Climate change devastated these tropical rainforests, abruptly fragmenting the habitat into isolated 'islands' and causing the extinction of many plant and animal species. Such stress can alter the growth rate of trees, which allows scientists to infer climate trends by analyzing the growth rate of tree rings. This branch of climate science is called dendroclimatology, and is one of the many ways they research climate trends prior to written records. Even though this is a field with many uncertainties, it is expected that over the next 50 years climate changes will have an effect on the diversity of forest genetic resources and thereby on the distribution of forest tree species and the composition of forests. Diversity of forest genetic resources enables the potential for a species (or a population) to adapt to climatic changes and related future challenges such as temperature changes, drought, pests, diseases and forest fire. However, species are not naturally capable to adapt in the pace of which the climate is changing and the increasing temperatures will most likely facilitate the spread of pests and diseases, creating an additional threat to forest trees and their populations. To inhibit these problems human interventions, such as transfer of forest reproductive material, may be needed. Remains of beetles are common in freshwater and land sediments. Different species of beetles tend to be found under different climatic conditions. Given the extensive lineage of beetles whose genetic makeup has not altered significantly over the millennia, knowledge of the present climatic range of the different species, and the age of the sediments in which remains are found, past climatic conditions may be inferred. The studies of the impact in vertebrates are few mainly from developing countries, where there are the fewest studies; between 1970 and 2012, vertebrates declined by 58 percent, with freshwater, marine, and terrestrial populations declining by 81, 36, and 35 percent, respectively. According to the IPCC, human-caused global warming is driving climate changes impacting both human and natural systems on all continents and across the oceans. Human-caused global warming results from the increased use of fossil fuels in transportation, manufacturing and communications. Internet induced climate change is newest contributor to human-induced climate change. Some of the impacts include the altering of ecosystems (with a few extinctions), threat to food production and water supplies due to extreme weather, and the dislocation of human communities due to sea level rise and other climate factors. Taken together these hazards also exacerbate other stressors such as poverty. Possible societal responses include efforts to prevent additional climate change, adapting to unavoidable climate change, and possible future climate engineering. ^ a b Petit, J.R.; Jouzel, J.; Raynaud, D.; Barkov, N.I. ; Barnola, J.-M.; Basile, I.; Bender, M.; Chappellaz, J.; Davis, M.; Delaygue, G.; Delmotte, M.; Kotlyakov, V.M. ; Legrand, M.; Lipenkov, V.Y. ; Lorius, C.; Ritz, C.; Saltzman, E. (1999-06-03). "Climate and atmospheric history of the past 420,000 years from the Vostok ice core, Antarctica". Nature. 399 (1): 429–46. Bibcode:1999Natur.399..429P. doi:10.1038/20859. ^ Hsiung, Jane (November 1985). "Estimates of Global Oceanic Meridional Heat Transport". Journal of Physical Oceanography. 15 (11): 1405–1413. doi:10.1175/1520-0485(1985)015<1405:EOGOMH>2.0.CO;2. ^ Vallis, Geoffrey K.; Farneti, Riccardo (October 2009). "Meridional energy transport in the coupled atmosphere–ocean system: scaling and numerical experiments". Quarterly Journal of the Royal Meteorological Society. 135 (644): 1643–1660. doi:10.1002/qj.498. ^ Trenberth, Kevin E.; et al. (2009). "Earth's Global Energy Budget". Bulletin of the American Meteorological Society. 90 (3): 311–323. Bibcode:2009BAMS...90..311T. doi:10.1175/2008BAMS2634.1. ^ Brown, Patrick T.; Li, Wenhong; Cordero, Eugene C.; Mauget, Steven A. (2015-04-21). "Comparing the model-simulated global warming signal to observations using empirical estimates of unforced noise". Scientific Reports. 5: 9957. Bibcode:2015NatSR...5E9957B. doi:10.1038/srep09957. ISSN 2045-2322. PMC 4404682. PMID 25898351. ^ Hasselmann, K. (1976-12-01). "Stochastic climate models Part I. Theory". Tellus. 28 (6): 473–85. Bibcode:1976TellA..28..473H. doi:10.1111/j.2153-3490.1976.tb00696.x. ISSN 2153-3490. ^ Meehl, Gerald A.; Hu, Aixue; Arblaster, Julie M.; Fasullo, John; Trenberth, Kevin E. (2013-04-08). "Externally Forced and Internally Generated Decadal Climate Variability Associated with the Interdecadal Pacific Oscillation". Journal of Climate. 26 (18): 7298–310. Bibcode:2013JCli...26.7298M. doi:10.1175/JCLI-D-12-00548.1. ISSN 0894-8755. ^ England, Matthew H.; McGregor, Shayne; Spence, Paul; Meehl, Gerald A.; Timmermann, Axel; Cai, Wenju; Gupta, Alex Sen; McPhaden, Michael J.; Purich, Ariaan (2014-03-01). "Recent intensification of wind-driven circulation in the Pacific and the ongoing warming hiatus". Nature Climate Change. 4 (3): 222–27. Bibcode:2014NatCC...4..222E. doi:10.1038/nclimate2106. ISSN 1758-678X. ^ Brown, Patrick T.; Li, Wenhong; Li, Laifang; Ming, Yi (2014-07-28). "Top-of-atmosphere radiative contribution to unforced decadal global temperature variability in climate models". Geophysical Research Letters. 41 (14): 2014GL060625. Bibcode:2014GeoRL..41.5175B. doi:10.1002/2014GL060625. ISSN 1944-8007. ^ Palmer, M. D.; McNeall, D. J. (2014-01-01). "Internal variability of Earth's energy budget simulated by CMIP5 climate models". Environmental Research Letters. 9 (3): 034016. Bibcode:2014ERL.....9c4016P. doi:10.1088/1748-9326/9/3/034016. ISSN 1748-9326. ^ Spracklen, D. V.; Bonn, B.; Carslaw, K. S. (2008). "Boreal forests, aerosols and the impacts on clouds and climate". Philosophical Transactions of the Royal Society A: Mathematical, Physical and Engineering Sciences. 366 (1885): 4613–26. Bibcode:2008RSPTA.366.4613S. doi:10.1098/rsta.2008.0201. PMID 18826917. ^ Christner, B. C.; Morris, C. E.; Foreman, C. M.; Cai, R.; Sands, D. C. (2008). "Ubiquity of Biological Ice Nucleators in Snowfall". Science. 319 (5867): 1214. Bibcode:2008Sci...319.1214C. doi:10.1126/science.1149757. PMID 18309078. ^ Schwartzman, David W.; Volk, Tyler (1989). "Biotic enhancement of weathering and the habitability of Earth". Nature. 340 (6233): 457–60. Bibcode:1989Natur.340..457S. doi:10.1038/340457a0. ^ Kopp, R.E. ; Kirschvink, J.L. ; Hilburn, I.A. ; Nash, C.Z. (2005). "The Paleoproterozoic snowball Earth: A climate disaster triggered by the evolution of oxygenic photosynthesis". Proceedings of the National Academy of Sciences. 102 (32): 11131–36. Bibcode:2005PNAS..10211131K. doi:10.1073/pnas.0504878102. PMC 1183582. PMID 16061801. ^ Kasting, J.F. ; Siefert, JL (2002). "Life and the Evolution of Earth's Atmosphere". Science. 296 (5570): 1066–68. Bibcode:2002Sci...296.1066K. doi:10.1126/science.1071184. PMID 12004117. ^ Mora, C.I. ; Driese, S.G.; Colarusso, L. A. (1996). "Middle to Late Paleozoic Atmospheric CO2 Levels from Soil Carbonate and Organic Matter". Science. 271 (5252): 1105–07. Bibcode:1996Sci...271.1105M. doi:10.1126/science.271.5252.1105. ^ Berner, R.A. (1999). "Atmospheric oxygen over Phanerozoic time". Proceedings of the National Academy of Sciences. 96 (20): 10955–57. Bibcode:1999PNAS...9610955B. doi:10.1073/pnas.96.20.10955. PMC 34224. PMID 10500106. ^ Bains, Santo; Norris, Richard D.; Corfield, Richard M.; Faul, Kristina L. (2000). "Termination of global warmth at the Palaeocene/Eocene boundary through productivity feedback". Nature. 407 (6801): 171–74. Bibcode:2000Natur.407..171B. doi:10.1038/35025035. PMID 11001051. ^ Zachos, J.C.; Dickens, G.R. (2000). "An assessment of the biogeochemical feedback response to the climatic and chemical perturbations of the LPTM". GFF. 122: 188–89. doi:10.1080/11035890001221188. ^ Speelman, E.N. ; Van Kempen, M.M.L. ; Barke, J.; Brinkhuis, H.; Reichart, G.J. ; Smolders, A.J.P. ; Roelofs, J.G.M. ; Sangiorgi, F.; De Leeuw, J.W. ; Lotter, A.F. ; Sinninghe Damsté, J.S. (2009). "The Eocene Arctic Azolla bloom: Environmental conditions, productivity and carbon drawdown". Geobiology. 7 (2): 155–70. doi:10.1111/j.1472-4669.2009.00195.x. PMID 19323694. ^ Brinkhuis, Henk; Schouten, Stefan; Collinson, Margaret E.; Sluijs, Appy; Sinninghe Damsté, Jaap S. Sinninghe; Dickens, Gerald R.; Huber, Matthew; Cronin, Thomas M.; Onodera, Jonaotaro; Takahashi, Kozo; Bujak, Jonathan P.; Stein, Ruediger; Van Der Burgh, Johan; Eldrett, James S.; Harding, Ian C.; Lotter, André F.; Sangiorgi, Francesca; Van Konijnenburg-Van Cittert, Han van Konijnenburg-van; De Leeuw, Jan W.; Matthiessen, Jens; Backman, Jan; Moran, Kathryn; Expedition 302, Scientists (2006). "Episodic fresh surface waters in the Eocene Arctic Ocean". Nature. 441 (7093): 606–09. Bibcode:2006Natur.441..606B. doi:10.1038/nature04692. PMID 16752440. ^ Retallack, Gregory J. (2001). "Cenozoic Expansion of Grasslands and Climatic Cooling". The Journal of Geology. 109 (4): 407–26. Bibcode:2001JG....109..407R. doi:10.1086/320791. ^ Dutton, Jan F.; Barron, Eric J. (1997). "Miocene to present vegetation changes: A possible piece of the Cenozoic cooling puzzle". Geology. 25: 39. Bibcode:1997Geo....25...39D. doi:10.1130/0091-7613(1997)025<0039:MTPVCA>2.3.CO;2. ^ Susan Solomon; Gian-Kasper Plattner; Reto Knutti; Pierre Friedlingstein (2009). "Irreversible climate change due to carbon dioxide emissions". Proceedings of the National Academy of Sciences of the United States of America. Proceedings of the National Academy of Sciences of the United States of America. 106 (6): 1704–09. Bibcode:2009PNAS..106.1704S. doi:10.1073/pnas.0812721106. PMC 2632717. PMID 19179281. ^ "3. Are human activities causing climate change? | Australian Academy of Science". www.science.org.au. Retrieved 2017-08-12. ^ a b "Milankovitch Cycles and Glaciation". University of Montana. Archived from the original on 2011-07-16. Retrieved 2 April 2009. ^ Gale, Andrew S. (1989). "A Milankovitch scale for Cenomanian time". Terra Nova. 1 (5): 420–25. Bibcode:1989TeNov...1..420G. doi:10.1111/j.1365-3121.1989.tb00403.x. ^ Ribas, Ignasi (February 2010). The Sun and stars as the primary energy input in planetary atmospheres. Proceedings of the IAU Symposium 264 'Solar and Stellar Variability – Impact on Earth and Planets'. 264. pp. 3–18. arXiv:0911.4872. Bibcode:2010IAUS..264....3R. doi:10.1017/S1743921309992298. ^ a b Marty, B. (2006). "Water in the Early Earth". Reviews in Mineralogy and Geochemistry. 62: 421–50. Bibcode:2006RvMG...62..421M. doi:10.2138/rmg.2006.62.18. ^ Watson, E.B. ; Harrison, TM (2005). "Zircon Thermometer Reveals Minimum Melting Conditions on Earliest Earth". Science. 308 (5723): 841–44. Bibcode:2005Sci...308..841W. doi:10.1126/science.1110873. PMID 15879213. ^ Hagemann, Steffen G.; Gebre-Mariam, Musie; Groves, David I. (1994). "Surface-water influx in shallow-level Archean lode-gold deposits in Western, Australia". Geology. 22 (12): 1067. Bibcode:1994Geo....22.1067H. doi:10.1130/0091-7613(1994)022<1067:SWIISL>2.3.CO;2. ^ Sagan, C.; Chyba, C (1997). "The Early Faint Sun Paradox: Organic Shielding of Ultraviolet-Labile Greenhouse Gases". Science. 276 (5316): 1217–21. Bibcode:1997Sci...276.1217S. doi:10.1126/science.276.5316.1217. PMID 11536805. ^ Willson, Richard C.; Hudson, Hugh S. (1991). "The Sun's luminosity over a complete solar cycle". Nature. 351 (6321): 42–44. Bibcode:1991Natur.351...42W. doi:10.1038/351042a0. ^ Willson, Richard C. (2003). "Secular total solar irradiance trend during solar cycles 21–23". Geophysical Research Letters. 30 (5): n/a. Bibcode:2003GeoRL..30.1199W. doi:10.1029/2002GL016038. ^ Bard, Edouard; Raisbeck, Grant; Yiou, Françoise; Jouzel, Jean (2000). "Solar irradiance during the last 1200 years based on cosmogenic nuclides". Tellus B. 52 (3): 985–92. Bibcode:2000TellB..52..985B. doi:10.1034/j.1600-0889.2000.d01-7.x. ^ Svensmark, Henrik; Bondo, Torsten; Svensmark, Jacob (2009). "Cosmic ray decreases affect atmospheric aerosols and clouds". Geophysical Research Letters. 36 (15): n/a. Bibcode:2009GeoRL..3615101S. doi:10.1029/2009GL038429. ^ Haigh, Joanna D.; Ann R. Winning; Ralf Toumi; Jerald W. Harder (2010-10-07). "An influence of solar spectral variations on radiative forcing of climate" (PDF). Nature. 467 (7316): 696–699. Bibcode:2010Natur.467..696H. doi:10.1038/nature09426. ISSN 0028-0836. PMID 20930841. Currently there is insufficient observational evidence to validate the spectral variations observed by SIM, or to fully characterize other solar cycles, but our findings raise the possibility that the effects of solar variability on temperature throughout the atmosphere may be contrary to current expectations. ^ Jasper Kirkby; et al. (2011). "CERN's CLOUD experiment provides unprecedented insight into cloud formation". Nature. doi:10.1038/news.2011.504. ^ a b Miles, M.G. ; Grainger, R.G. ; Highwood, E.J. (2004). "The significance of volcanic eruption strength and frequency for climate" (PDF). Quarterly Journal of the Royal Meteorological Society. 130 (602): 2361–76. doi:10.1256/qj.30.60 (inactive 2018-11-11). ^ Oppenheimer, Clive (2003). "Climatic, environmental and human consequences of the largest known historic eruption: Tambora volcano (Indonesia) 1815". Progress in Physical Geography. 27 (2): 230–59. doi:10.1191/0309133303pp379ra. ^ Wignall, P (2001). "Large igneous provinces and mass extinctions". Earth-Science Reviews. 53 (1): 1–33. Bibcode:2001ESRv...53....1W. doi:10.1016/S0012-8252(00)00037-4. ^ Graf, H.-F.; Feichter, J.; Langmann, B. (1997). "Volcanic sulphur emissions: Estimates of source strength and its contribution to the global sulphate distribution". Journal of Geophysical Research: Atmospheres. 102 (D9): 10727–38. Bibcode:1997JGR...10210727G. doi:10.1029/96JD03265. ^ "Volcanic Gases and Their Effects". U.S. Department of the Interior. 2006-01-10. Retrieved 21 January 2008. ^ Annexes,[page needed] in IPCC AR4 SYR 2007. ^ Forest, C.E. ; Wolfe, J.A. ; Molnar, P.; Emanuel, K.A. (1999). "Paleoaltimetry incorporating atmospheric physics and botanical estimates of paleoclimate". Geological Society of America Bulletin. 111 (4): 497–511. Bibcode:1999GSAB..111..497F. doi:10.1130/0016-7606(1999)111<0497:PIAPAB>2.3.CO;2. ^ Bruckschen, Peter; Oesmanna, Susanne; Veizer, Ján (1999-09-30). "Isotope stratigraphy of the European Carboniferous: proxy signals for ocean chemistry, climate and tectonics". Chemical Geology. 161 (1–3): 127–63. Bibcode:1999ChGeo.161..127B. doi:10.1016/S0009-2541(99)00084-4. ^ Parrish, Judith T. (1993). "Climate of the Supercontinent Pangea". Chemical Geology. The University of Chicago Press. 101 (2): 215–33. Bibcode:1993JG....101..215P. doi:10.1086/648217. JSTOR 30081148. ^ Atri, Dimitra; Melott, Adrian L. (January 2014). "Cosmic rays and terrestrial life: A brief review". Astroparticle Physics. 53: 186–90. arXiv:1211.3962. Bibcode:2014APh....53..186A. doi:10.1016/j.astropartphys.2013.03.001. ^ Brugger, Julia; Feulner, Georg; Petri, Stefan (April 2017), "Severe environmental effects of Chicxulub impact imply key role in end-Cretaceous mass extinction", 19th EGU General Assembly, EGU2017, proceedings from the conference held 23-28 April, 2017 in Vienna, Austria., p.17167, Bibcode:2017EGUGA..1917167B. ^ a b Demenocal, P.B. (2001). "Cultural Responses to Climate Change During the Late Holocene" (PDF). Science. 292 (5517): 667–73. Bibcode:2001Sci...292..667D. doi:10.1126/science.1059827. PMID 11303088. ^ Sindbaek, S.M. (2007). "Networks and nodal points: the emergence of towns in early Viking Age Scandinavia". Antiquity. 81 (311): 119–32. doi:10.1017/s0003598x00094886. ^ Von Radowitz, John (April 23, 1998). "CLIMATE WARMEST SINCE MIDDLE AGES". Century Newspapers LTD.
^ Shaftel, Holly (ed.). "Climate Change: How do we know?". NASA Global Climate Change. Earth Science Communications Team at NASA's Jet Propulsion Laboratory. Retrieved 2017-12-16. ^ a b Zhang, Jinlun; Lindsay, Ron; Steele, Mike; Schweiger, Axel (11 June 2008). "What drove the dramatic retreat of arctic sea ice during summer 2007?". Geophysical Research Letters. 35: 1–5. Bibcode:2008GeoRL..3511505Z. doi:10.1029/2008GL034005. ^ "Singapore underwater". The Straits Times. Retrieved 2017-05-31. ^ "How Singapore is responding to the threat of rising sea levels". The Straits Times. Retrieved 2017-05-31. ^ Church, John A.; White, Neil J. (2006-01-16). "A 20th century acceleration in global sea-level rise". Geophysical Research Letters. 33 (1): n/a–n/a. Bibcode:2006GeoRL..33.1602C. doi:10.1029/2005gl024826. ISSN 1944-8007. ^ Norris, Joel R.; Allen, Robert J.; Evan, Amato T.; Zelinka, Mark D.; O'Dell, Christopher W.; Klein, Stephen A. (4 August 2016). "Evidence for climate change in the satellite cloud record". Nature. 536 (7614): 72–75. Bibcode:2016Natur.536...72N. doi:10.1038/nature18273 – via www.nature.com. ^ Witze, Alexandra (11 July 2016). "Clouds get high on climate change". Nature. doi:10.1038/nature.2016.20230. ^ a b Huntington, T.G. (U.S. Geological Survey) (March 2006). "Evidence for intensification of the global water cycle: Review and synthesis". Journal of Hydrology. 319 (1–4): 83–95. Bibcode:2006JHyd..319...83H. doi:10.1016/j.jhydrol.2005.07.003. ^ Smith, T. M.; Yin, X.; Gruber, A. (2006). "Variations in annual global precipitation (1979–2004), based on the Global Precipitation Climatology Project 2.5° analysis". Geophysical Research Letters. 33 (6). Bibcode:2006GeoRL..3306705S. doi:10.1029/2005GL025393. ^ Kinver, Mark (2011-11-15). "UK trees' fruit ripening '18 days earlier'". Bbc.co.uk. Retrieved 1 November 2012. ^ a b Sahney, S.; Benton, M.J.; Falcon-Lang, H.J. (2010). "Rainforest collapse triggered Pennsylvanian tetrapod diversification in Euramerica" (PDF). Geology. 38 (12): 1079–82. Bibcode:2010Geo....38.1079S. doi:10.1130/G31182.1. Retrieved 27 November 2013. ^ Bachelet, D.; Neilson, R.; Lenihan, J. M.; Drapek, R.J. (2001). "Climate Change Effects on Vegetation Distribution and Carbon Budget in the United States". Ecosystems. 4 (3): 164–85. doi:10.1007/s10021-001-0002-7. ^ Langdon, P.G. ; Barber, K.E. ; Lomas-Clarke, S.H. ; Lomas-Clarke, S.H. (August 2004). "Reconstructing climate and environmental change in northern England through chironomid and pollen analyses: evidence from Talkin Tarn, Cumbria". Journal of Paleolimnology. 32 (2): 197–213. Bibcode:2004JPall..32..197L. doi:10.1023/B:JOPL.0000029433.85764.a5. ^ Birks, H.H. (March 2003). "The importance of plant macrofossils in the reconstruction of Lateglacial vegetation and climate: examples from Scotland, western Norway, and Minnesota, US" (PDF). Quaternary Science Reviews. 22 (5–7): 453–73. Bibcode:2003QSRv...22..453B. doi:10.1016/S0277-3791(02)00248-2. ^ Miyoshi, N; Fujiki, Toshiyuki; Morita, Yoshimune (1999). "Palynology of a 250-m core from Lake Biwa: a 430,000-year record of glacial–interglacial vegetation change in Japan". Review of Palaeobotany and Palynology. 104 (3–4): 267–83. doi:10.1016/S0034-6667(98)00058-X. ^ Prentice, I. Colin; Bartlein, Patrick J; Webb, Thompson (1991). "Vegetation and Climate Change in Eastern North America Since the Last Glacial Maximum". Ecology. 72 (6): 2038–56. doi:10.2307/1941558. JSTOR 1941558. ^ "Internet a major contributor to climate change, finds new book". Green News. 24 Sep 2018. Ipcc ar4 wg1 (2007). Solomon, S.; Qin, D.; Manning, M.; Chen, Z.; Marquis, M.; Averyt, K.B. ; Tignor, M.; Miller, H.L., eds. Climate Change 2007: The Physical Science Basis. Contribution of Working Group I to the Fourth Assessment Report of the Intergovernmental Panel on Climate Change. Cambridge University Press. ISBN 978-0-521-88009-1. (pb: 978-0-521-70596-7). Ipcc ar4 syr (2007). Core Writing Team; Pachauri, R.K; Reisinger, A., eds. Climate Change 2007: Synthesis Report. Contribution of Working Groups I, II and III to the Fourth Assessment Report of the Intergovernmental Panel on Climate Change. IPCC. ISBN 92-9169-122-4. .
IPCC TAR WG1 (2001). Houghton, J.T. ; Ding, Y.; Griggs, D.J. ; Noguer, M.; van der Linden, P.J. ; Dai, X.; Maskell, K.; Johnson, C.A., eds. Climate Change 2001: The Scientific Basis. Contribution of Working Group I to the Third Assessment Report of the Intergovernmental Panel on Climate Change. Cambridge University Press. ISBN 0-521-80767-0. Archived from the original on 30 March 2016. (pb: 0-521-01495-6). Ipcc ar4 wg1 (2007). "Summary for Policymakers". In Solomon, S.; Qin, D.; Manning, M.; Chen, Z.; Marquis, M.; Averyt, K.B. ; Tignor, M.; Miller, H.L. Climate Change 2007: The Physical Science Basis. Contribution of Working Group I to the Fourth Assessment Report of the Intergovernmental Panel on Climate Change. Cambridge University Press. ISBN 978-0-521-88009-1. (pb: 978-0-521-70596-7). Ipcc ar4 syr (2007). "Summary for Policymakers". In Core Writing Team; Pachauri, R.K; Reisinger, A. Climate Change 2007: Synthesis Report. Contribution of Working Groups I, II and III to the Fourth Assessment Report of the Intergovernmental Panel on Climate Change. IPCC. ISBN 92-9169-122-4. Emanuel, K. (August 2005). "Increasing destructiveness of tropical cyclones over the past 30 years" (PDF). Nature. 436 (7051): 686–88. Bibcode:2005Natur.436..686E. doi:10.1038/nature03906. PMID 16056221.